After a 3-week break, we are back in Europe. Barcelona is the town and Catalunya is the racetrack. Its not a favorite track for most F1 fans as overtaking is next to impossible here. Also – the race has been won by the polesitter the last 9 years before this one. So the race winner is usually pretty much decided on Saturday as well. The long break saw all the teams bringing significant updates to their cars. Hoping to close the gap to the Red Bulls. Most notably was the dual airintake on the Mercedes car. Meant to decrease drag and improve airflow towards the rear wing. Very creative. A longer wheelbase was also implemented to help car balance and hopefully cure some of Schumachers woes. Button made a small mistake on his last lap which allowed Alonso to squeeze himself in between the two McLarens in 4th. We also saw Schumacher outqualify Rosberg for the first time this year. Were those changes focused mainly on Schumacher? The race start was undramatic compared to last years where we saw 6-7 cars tangle after the first corner in a mayhem of tiresmoke and pieces of carbon fibre. This time the top 6 cars slotted in behind each other in same the order they started. One would have suspected Vettel to keep the pressure on Webber. Possibly to be able to pass him during the pit stops. But instead the Australian gradually pulled away. But that was to be the least of Vettels problems. Two people stood out in the start. Jaime Alguersuari who started 16th and made his way up to 9th on the first lap. His onboard camera showed him cleverly picking a good line and avoiding contact. And Rubens Barrichello that started 18th and overtook his teammate Hulkenberg on lap 1 who had started 13th. Rubens brought the Williams home in 9th.Very impressive as I consider the Williams the worst car if you leave out the new teams. Vettel was the first of the trio in front to pit for new rubber. That took place on lap 16 – and it was a slow stop. Unusual for the Red Bull team as they have been one of the quickest teams, if not the quickest in the pits. Hamilton pitted on the next lap and his stop was 2 seconds shorter than Vettels stop and that was enough for him to just edge ahead. Vettel tried to defend in Turn 1 but had to go off track shortly, handing second place to the Brit. The Virgin car of Di Grassi also played a small part in this as it looked like he almost came to a complete stop when he saw the Red Bull and the McLaren come charging down towards him. Hamilton had to swerve to avoid contact. The funny thing is that the colorscheme on the Virgin car almost makes it look like what it is. A moving traffic cone. We also saw Schumacher making an early stop on lap 14, but he must have put in 2 impressive laps after that, because when Button came out of the pits two laps later they were side by side into Turn 1! Schumacher held his position and Button had to give. It was a brilliant move by the ‘old’ fox and watching it was like going back 10 years in time. Best move of the race. Button wasnt happy about Schumachers move after the race, but from the outside it came across as an aggressive yet clean move. What McLaren should have done was take him in one lap after Schumachers stop, not two laps. Schumacher made up the time he needed on his fresh tires in those two laps. What followed was another great battle between them when Button tried to repass him several times by the advantage of the F-duct on the McLaren. But the extra top speed on the straight was not enough as Schumacher defended his 5th position beautifully. Textbook stuff. 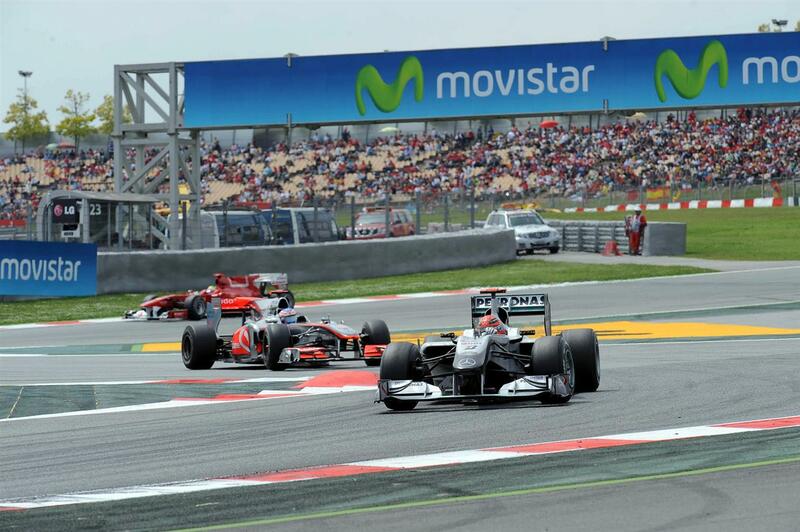 My second favorite move was when Alguersuari passed Hulkenberg in Turn 1. He just cut across as soon as he had outbraked him and it took some huge cajones to pull off that move. I guess the fight he had with Schumacher in Australia really changed him. Unfortunately he threw it away when he made a strange contact with Chandok on lap 29. It looked like an easy pass but all of a sudden he turns in too early and bangs into the side of the HRT car. Strange move indeed. Result: Chandok retires and a drive-tru for Jaime. Too bad. But he will be back. He did salvage one point by finishing 10th though. On lap 55, Vettel pits again to our surprise. He drops down to 4th. Why? With 11 laps to go it seemed absurd. Replays shows him wriggling under braking and going wide over the gravel. Was his tires used up? Team radio then reveals the problem. His brakes are almost gone. My guess is he felt a problem and remembered Australia where he had a brake failure that retired him. He said then that he felt the problem before it happened, so my guess is that they were trying to prevent that from happening again. Vettel revealed in an interview after the race that the team actually wanted him to retire for safety reasons but he argued with them to keep going. Good for him. So Webber wins the Spanish GP with ease. And Vettel salvages 3rd place through great trials. The ever lucky Alonso is there again to pick up the scraps from others misfortunes. But he did have an engine failure in Malaysia, so I guess it all evens out in the end. You know, in normal circumstances Webber would deserve it as he was faultless. But Im gonna give it to Vettel. Reason? He had a crap pitstop that through no fault of his own made him lose a place. A non working adjustable front wing. Brakes that were shot to hell. Which meant he had to nurse the car to the finish. And yet he brought it home in 3rd. Thanks to Hamiltons crash of course, but still. Very well done. He is getting quite good at preserving and bringing a damaged car home. I hope for his sake that it wont be a regular happening in the Red Bull. It had a few good moments. The Schumacher-Button battle. The tension if Sebastian would get his Red Bull over the finish line. But that was pretty much it. I dont like the track, I think they should change the design of the last three corners as soon as possible. No one needs this. It could be made better for overtaking without costing a fortune. Just redesign the last part of the track. Anyway – thats behind us. The standings are very close and Monaco is only a week away. Red Bull are favorites to take pole again and the win. But with 24 cars on the track in Q1, anything can happen. Frontrunners can suddenly find themselves out in Q1. Unless they go forward with dividing Q1 into 2 portions. Then we might have less of a lottery in qualifying. Lets just wait and see what happens as I am sure someone really cool would say. It was the teams fault this time for sure. It wasnt excessive tire wear which we have seen have been Lewis problem several times in the past. The parts have been shipped back to the Macca Tech centre for analysis. Also Jensons wheel that was a bit faulty as well. Didnt shift properly and no gear shift lights either. Another four leaves clover race i suppose, i related it to Ferrari + Fernando Alonso. There are always “if” out there. Why do they always have such a luck? That second place from him really not deserve. If Ham not retired, if Button were not stuck behind MS, if Vettel didnt have the damn prob, where will the F60 finish? No where, they are just too slow. And the damn funny thing now is, Ferrari announced to investigate on Felippe Massa poor performance? huh? Karma? for what he has done to Kimi? Did they even attempt to do this to Kimi. What is so special about Massa? This is definitely a boring race. I dont know whether i am really looking forward for Monaco. I just wish that they bring back 1 lap qualifying, refueling and the iceman. 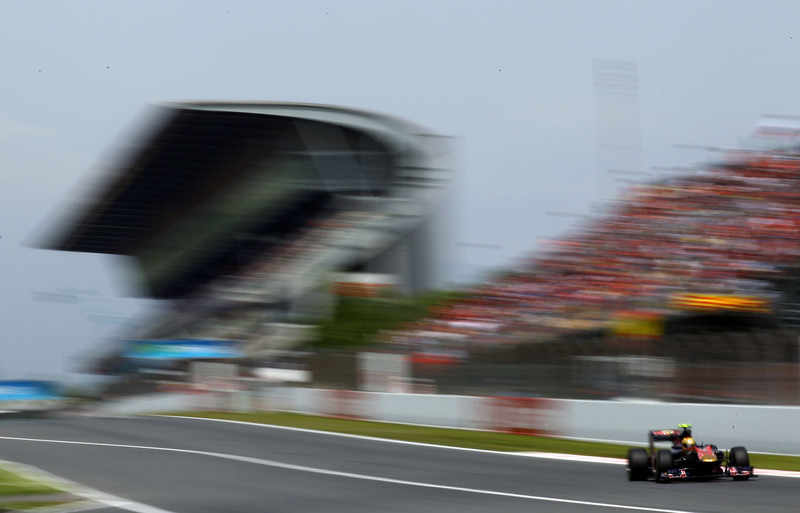 Ferrari is only the 3rd quickest team but Alonso is making the most of it. The car suits him and that helps a lot. It is not working out for Massa at the moment. If that is car setup/balance or possibly remnants of his accident we may never know. The excitement for Monaco will definately be the Saturday qualifying. I Agree with you Soren, The track is boring. Spa is the best. Thank you for the review. What happened to Hamilton is too bad, but quite frankly I can`t say I`ll shed a tear over that one. The worst thing about it was Alonso profiting on someone elses misfortune. On the other hand, Vettel got his position back after a bad pit-stop -fair and square! Now I am really looking forward to the coming events, -Monaco and Portugal! Even if I never was Schumachers fan, I always love seeing good racecraft – and he showed his talent like before in Spain. He did what he could with what he had. So that was fun. FOM already took down the Schumacher-Button pass link I put up, so I exchanged it with another one. Lets see how long that lasts.